Well, NOAA Ship Oscar Dyson docked in Dutch Harbor on August 11th from the 19-day journey in the Eastern Bering Sea. During our time at sea, I learned so much and got to know both the NOAA scientists and the crew and officers on the ship. When I applied for the Teacher at Sea program, I knew that it would be an invaluable experience, but it far exceeded my expectations. I learned about the work of the NOAA scientists pretty much non-stop and any question I had was answered in detail, which allowed me to have a robust picture of the work the NOAA scientists do, the different types of scientific instruments they use and the underlying principles behind them as well as the day-to-day operations of a scientific vessel such as NOAA Ship Oscar Dyson. Additionally, I also ate the best food of my life made by the stewards; there was always amazing entrees and dessert at every meal! After we came into port, I was able to explore the town of Dutch Harbor as well. Along with other NOAA Scientists and the ship’s medic, I explored the Museum of the Aleutians in town and learned about the native people of the island and their traditions as well as the military encampments that were built on Unalaska (the island where Dutch Harbor is) during WWII. The next day we went up Ballyhoo mountain and saw the ruins of one of the WWII bases. The view from there was amazing and we saw all around Unalaska. I was surprised in Dutch Harbor to see so many bald eagles everywhere! The next day I said goodbye to the many people I got to know aboard the Oscar Dyson, many of whom were staying aboard for the next leg or for a long time thereafter. I was surprised how easily I transitioned to life aboard the boat and it still feels a bit weird to not be moving all the time! 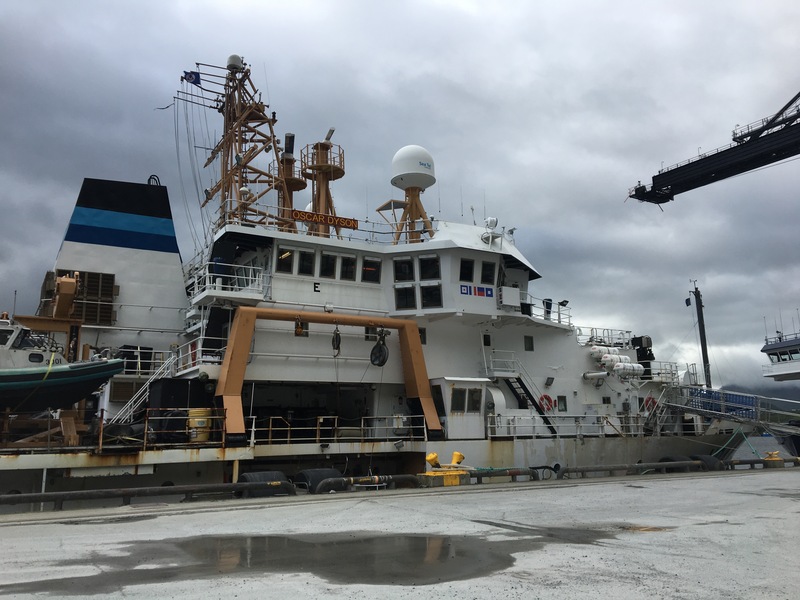 This entry was posted in 2018, Emily Cilli-Turner, NOAA Teacher at Sea and tagged Eastern Bering Sea, NOAA Ship Oscar Dyson, Pollock Survey. Bookmark the permalink.